Why Akeeba and why backup? Here is the simple answer: it’s a great working product that does exactly what you need – and you need backups. If you are the kind of person who thinks to yourself, “I don’t need backups” you should do some deep soul searching and think about all of your projects in the past. Now imagine that those projects just disappeared – would you be upset? Of course – who wouldn’t be, right? People who use backups – that’s who! But what about Git? Yea, we like git just as much as the next dev – and while it can put your database under revision control – it’s a pain to do that. Imagine having just one backup that contained both your database schema and it’s content – along with all of your flat files on your server that could be easily deployed within minutes. Sounds awesome doesn’t it? 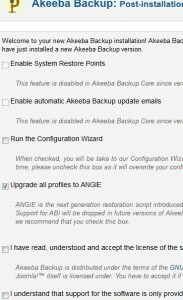 Akeeba backup is literally a ‘one stop shop’. You install it, create backups as needed (and it also has the functionality to backup on a schedule (CRON jobs) with the pro version) and relax. You can use it alongside Git without a worry – this is just an added layer of defense in case something bad happens (and given enough time, especially with sites built using one of the top 2 CMS) – bad things will most likely happen at some point. I have no idea what I’m doing but I broke my site badly – how do I start fresh? As you can imagine there are dozens more competent reasons as well – from being hacked to moving servers. So now that we’re all in agreement that backups are a great requirement for any site – lets check out how we can get Akeeba backup to work for us! We are operating under the assumption that you have a site either Joomla! or WordPress installed and operational (either locally or on a server). For this tutorial we’ll be using a Joomla! site installed locally. Select your options: You’ll see a screen with some options – you’ll have to select to agree to the terms and such and we highly recommend using the configuration wizard! It will literally walk you through – step by step – most of the defaults you’ll find to be perfectly acceptable. Select ‘Backup Now’ – this will bring you to the screen where you can enter a brief description and comments about your backup. We generally put some references to the day/time/version so we can know at a glance which is the most recent (although that is easy in Akeeba as well). It will go through the process of backing everything up (including your DB and all of its goodies!) this generally takes anywhere from 30 seconds to 5 minutes depending on your host. As with most things – it appears GoDaddy generally takes longer than most other hosts. Once complete it will let you know and give you the option to go straight to managing your backups. Something worth noting here is that the backup created is a .jpa or .zip (or whichever format you save in) that is created on the server. Once you are managing your backups you can download them from that screen if you wish or FTP into the server and download them that way. At this point download your backup – yes, this is that easy. There is something we want to stress heavily also – TEST YOUR BACKUP. This cannot be stressed enough – test it! Install XAMPP or WAMP and then actually test your backup. Deploy it the same way you would on your live server – make sure that everything populates the way you want it to and that it works/looks/functions as it should. But my backup is a .jpa file – once I upload it to the server – what should I do then? Akeeba has you covered there, too. Akeeba kickstart will handle the dirty work of expanding the files and such, you just have to FTP it right up to your server and follow the instructions. At this point – you will understand that the whole process of ‘recovering from bad things’, can take less than 5 minutes with Akeeba backup & Akeeba kickstart. Less than 5 minutes to have a fully restored, fully functioning site up and going again. It will save you from the hassle of trying to contact your hosting provider for their backups and hoping it works and it will save you from the pit of despair when you realize you didn’t have a backup and lost everything. Make your life easier – it is hard enough as is. If you are using Joomla! 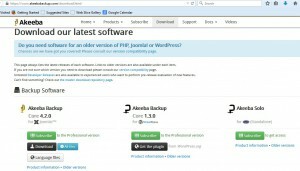 or WordPress (which many, many people do) – invest a little time into installing Akeeba backup. You will be very glad you did!